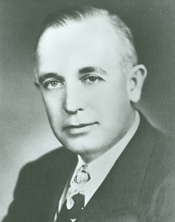 WILSON, George Howard, a Representative from Oklahoma; born in Mattoon, Coles County, Ill., August 21, 1905; moved with his parents to Oklahoma and attended the public schools of Enid; graduated from Phillips University, Enid, Okla., in 1926; student at the University of Michigan Law School in 1926 and 1927, and graduated from the law school of the University of Oklahoma in 1929; was admitted to the bar in 1928 and commenced the practice of law in 1929 in Enid, Okla.; deputy district court clerk of Garfield County, Okla., in 1928; special agent, Federal Bureau of Investigation, 1934-1938; city attorney of Enid, Okla., 1939-1942; served as a colonel in Judge Advocate Generals Department, United States Army, with overseas duty in the South Atlantic Theater of Operations 1942-1946; elected as a Democrat to the Eighty-first Congress (January 3, 1949-January 3, 1951); unsuccessful for reelection in 1950 to the Eighty-second Congress; director of Oklahoma State Crime Bureau in 1951; State judge, Superior Court, Garfield County, Okla., 1952-1968; chief judge, State Administrative Zone No. 1, 1967; president, Oklahoma Judicial Conference, 1968; district judge, 1969 to date; chief judge, Division No. 1, Judicial District No. 4; was a resident of Enid, Okla., until his death there July 16, 1985; interment in Memorial Park Cemetery.